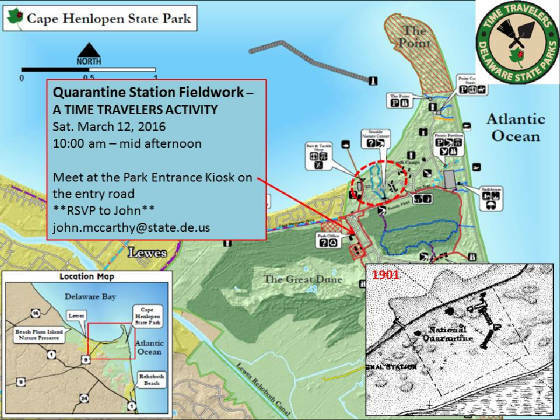 Time Travelers are members of the public who volunteer their time and talents to assist professional archaeologists and historians working in State Parks. Work includes research projects and the study and protection of our cultural heritage. Sound exciting? It is! Ready to join? Terrific! Follow the link for “Individual or Group Volunteer,” indicate that you are an individual volunteer, fill in your personal details, and in the “Why are you interested in volunteering?” box indicate that you are interested in becoming a “New Time Traveler”. You will be contacted to confirm your registration and additional information about upcoming events will be provided. May is coming and in addition to being Archaeology Month in Delaware and Historic Preservation Month nationally, it’s ArCH Days! You may recall that ArCH is the program held on the Green in Dover highlighting the arts, history, and preservation for 4th-grade students. Cultural and historic organizations from around the state offer a short demonstration, lesson, or activity to the students. ASD members and Time Travelers are needed to assist with running the ArCH Days station. this year. Contact John McCarthy at john.mccarthy@state.de.us for more details.